Here is a sketch of a proposed and hopefully one-day realized bronze sculpture for Mexico City. 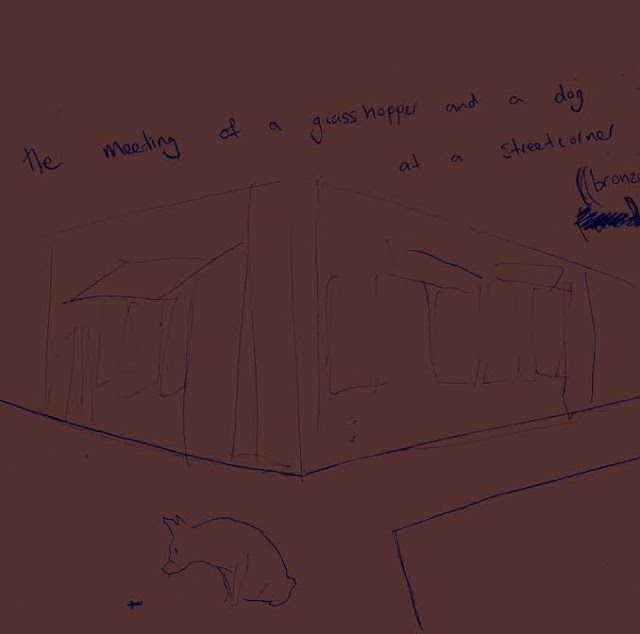 It depicts the meeting of a grasshopper and a dog at a street corner. The two life-size bronzes will be anchored in place at a suitable street corner in Mexico City, preferably at the meeting of two quiet streets. 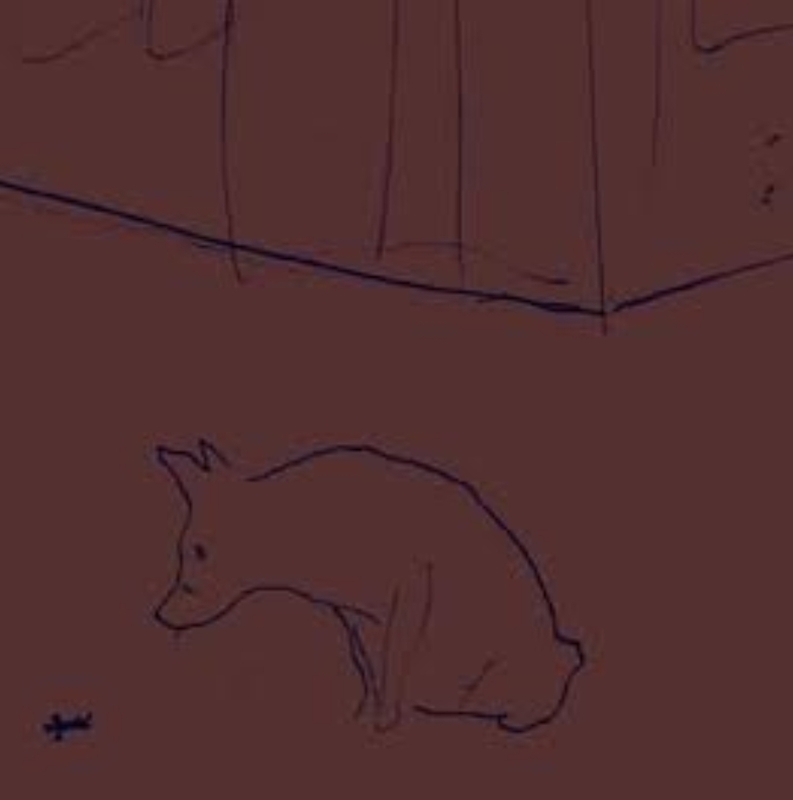 Mexico City is a city full of dogs (some as pets and others as street dogs) as well as of grasshoppers (both the dried crickets that people eat here as snacks, and the famous Chapultepec Castle, named from the Nahuatl word chapoltepēc which means "at the grasshopper's hill"). The sculpture is inspired by a sentiment by the poet Tristan Tzara, who wrote in his Sept manifestes Dada that dada, or free expression, should be seen as "the meeting place of contradiction, the point where the yes and the no meet, not solemnly in the castles of human philosophies, but very simply on street corners like dogs and grasshoppers." We hope that the sculpture delights with its innocence and whimsy, and makes it's viewers contemplate what beguiling people, places, animals, ideas, and thoughts they might meet at a street corner. Cherry Beach on Lake Ontario in Toronto is a beloved spot for numerous leisure activities. It is the closest main-land beach to the city centre with water access and it is adjacent to an area slated for an enormous redevelopment, converting the current industrial land there into residential and commercial buildings. While Cherry Beach is a delightful place, the condition of the beach surface is degraded. The beach has as much mud, silt, and construction debris as sand. Wading into the water brings cuts and scrapes to the feet. 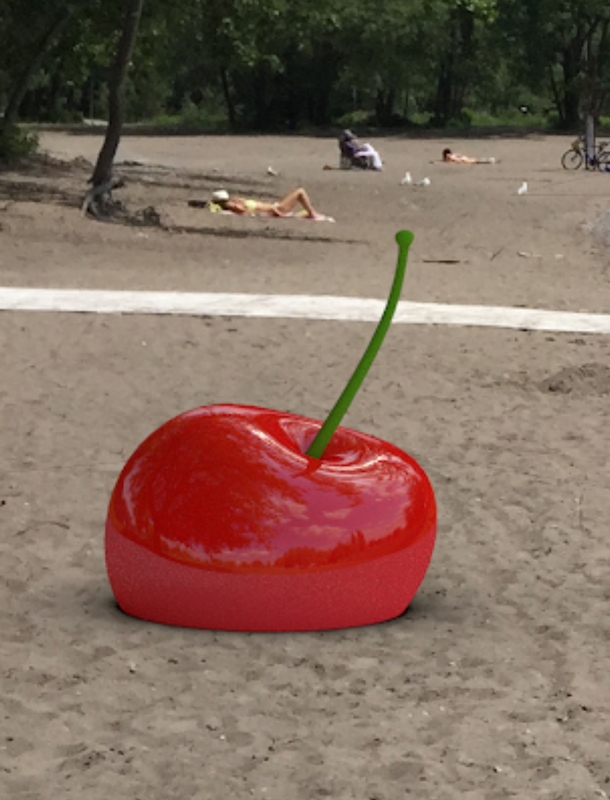 We propose that Cherry Beach can be sweeter. Our proposal aims to improve site conditions and to mitigate the forces that have created the site's current state. The sand at Cherry Beach was originally placed in its current location through coastal deposition processes from the Scarborough Bluffs. However, in the 1950s, the Toronto Harbour Commissioners initiated the construction of the Leslie Street Spit, later to become Tommy Thompson Park. The construction of this feature effectively cuts off the continued transport of sand from the Bluffs to Cherry Beach, as such there remains no new supply of sand to Cherry Beach. 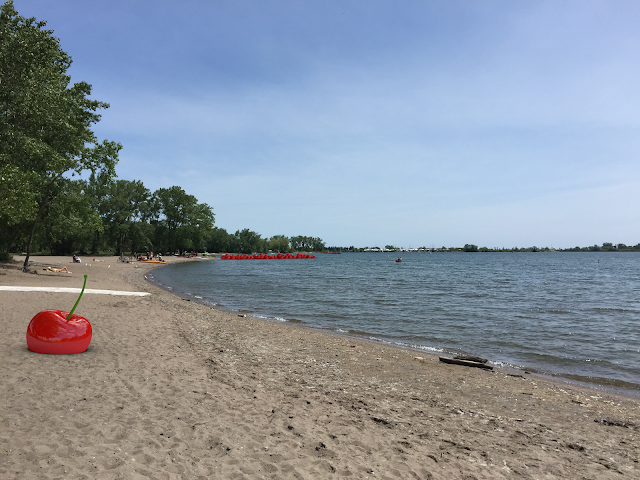 Given the configuration of Tommy Thompson Park, and the Toronto Islands waves and currents along the Cherry Beach only come in from the west. As such, sand placed on Cherry Beach generally moves in a west to east direction with little to no longshore currents that are able to move the sand back westward to Cherry Beach. 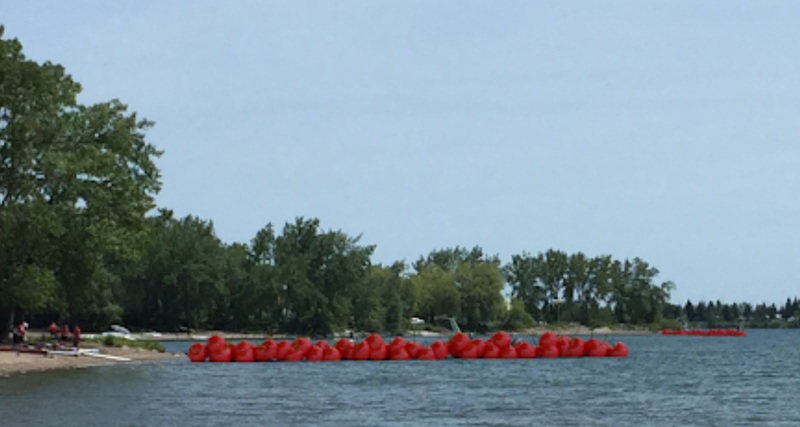 As a result, the observed conditions at Cherry Beach reflect the results of continuous movement of finer materials towards the east, leaving behind the larger materials behind. The Toronto and Region Conservation Authority conducted a study a few years ago which recommended the placement of a number of harder groyne structures perpendicular into the water so that they can capture and hold the sand close to the beach, however, there were concerns that it would too drastically change the character of the beach. Arzon Supermarket is in my opinion Toronto's finest Iranian grocery store. They are open 24 hours and I go all the time, usually very late at night, typically ordering either the fesanjoon stew or some of the various kebabs, grilled over what in the wee hours are just little piles of pale charcoal dust tended by a kindly white haired old man. He takes a torn piece of cardboard and waves it over your food. And that charcoal dust, seemingly hopelessly spent, springs back into life red hot. On a recent day I went to the store with my mother much earlier than normal, at around 8pm. My mom and I were there to get some baklava pastries. The two guys who are always there late at night manning the cash register were already there. They are both about late middle age. I see them all the time but I don't know their names. One of them is very handsome and I've always thought he looks like an Iranian George Clooney or Cary Grant. The other man has bulldog look of a beleaguered business man, which makes me believe he is the owner even though I don't think he is. I've always wanted to get to know these guys but other than pleasantries while paying I have never have really talked to them. With their help, my mom and I chose some pastries from the glass cases underneath the cash register. And we told both of them how we were going to serve these pastries at a charity dinner at a church. This seemed to pique the interest of the handsome one, but there were a bunch of customers in line behind us so we moved on and perused a bit in the store. There are hundreds of products in their brightly colored Farsi wrappers, fresh flatbreads strewn on shelves, towers of lemons, hookahs and pottery on high racks, portraits of royalty, flags, posters for visiting singers - an attempt to fit all that is longed for into one little store. My mom and I wandered over to the middle of the store. I showed her the freezer filled with sunshine-yellow saffron-and-rose-water ice cream. There are tubs of the ice cream alone, and some of it is sold in plastic cups where the ice cream sits swirled atop a pile of what look like white noodles. My mom and I have never seen ice cream with noodles and we wondered what it might be. The line at the cash had dissipated and I asked the guys there what these noodles were. They told me that they are made of rice, powdered rice. Persian heartthrob showed me a little bag of it in the form of flakes. Then he came around the counter and asked me and my mom to follow him. The three of us went over to a narrow aisle in the store where they have bulk bins. He reached down and handed us these little white things, misshapen bits like from the bottom of instant noodles. Mixed in with these were flakes and odd gravelly stone shapes very small and tiny. He motioned that we should taste them, and right as we put them in our mouths he says, "I want to ask for your help, can you help me find a woman?" Immediately I'm thinking this guy wants to ask my mom out or something, my newly widowed mom, but he kept going, "Do you know anyone? I've tried but all the women I meet are bad, they like to drink too much and do drugs and smoke. Do you know anyone at the church?" My mom looks at him with both kindness and sadness and says that she had met her husband at church, and then with a laugh that not all people at church are good. And we asked him about online dating and he said it didn't work. He said he didn't care about ethnicity or religion or anything, he said he was just desperate to meet a nice woman. Can anyone help him? My mom and I left with our pastries, not sure of what we should think. The white flakes we tried were totally flavorless and tasted like chalk, like the bitterness and emptiness of a life without love. Every Saturday night a holy ritual occurs off Don Mills Road between an LA Fitness and some industrial buildings at the Church of St George, an Egyptian Coptic church, where in the basement a group of young men gather to bake the Hamal - holy bread - the body of Christ. My brother, despite not being Egyptian or Coptic, has been helping bake the bread with his Egyptian friends for a number of years now. The many sensations of the bread-making room arrive all at once. It has bright white light like an restaurant kitchen and a high ceiling like it reaches into heaven yet is cramped at the bottom with equipment and six guys kneading dough elbow to elbow around a marble table. The air is sweet, humid, dusty, hot. The walls are decorated with tapped down posters of Coptic popes, saints, and Jesus, all painted in that strange kitsch style that makes them look both old and still to come. No surface escapes decoration - numerous saints can be tapped to a humidifier. The posters look supernaturally bright and vivid since every other surface of the room is coated in a thin white layer of flour. The dust floating in the air seems shaped by the melodically chanted Arabic that comes out of a grimy computer speaker atop a minifridge atop a countertop, and the room hums with the sound of these ceaselessly sung psalms. The singers are across the hall in a small wooden-pewed chapel that smells of incense and has finely decorated altar. Three men sing into a microphone and their words get piped across the hall to the bread-making room to bless the bread throughout its making. Sometimes these chants combine with the sound of the dough mixing machine spinning loudly. Other than the young men kneading dough, there is an older man, Uncle Atef, who the young men just call Uncle. He's the one who is in charge of the bread-making. He's the one who tapped up the pictures to the wall and the only one who can point to any picture on the wall and tell you who that saint was and what they did or which grey-bearded pope was which. When one of the young men leaves the break-making for good, moving say for school or marriage, Uncle Atef will pull down a poster of a saint and give it to them as a parting gift. Other than his faith, Uncle Atef holds no official religious title. He's in charge of the bread-making because he's done it for a long time, starting back in Egypt, and it's difficult work done late at night and he's the one willing to keep doing it. There's only three ingredients: flour, water, yeast. The final addition is labor. "It's actually a workout," says one young man. My brother, Daniel, adds, "Some days, it's work." Someone else shows me a scar from accidentally touching the oven. To make the bread they use 10 kilos of flour a batch. So much is made because there are five masses a week and communion at each one. At the end of a service there is a thing called bouraka where all the bread that isn't blessed is broken up and given out. There's definitely a lot of skill to making the bread. From slapping the hamal on the table, then bending it over your palm, then stamping it with complex wooden cross patterns and putting little holes in it to let off steam. The end result will be a round, ﬂuffy loaf of bread with crosses on top. "Round 2! All over again! Guys lets do it!" As the night goes on there's more and more joking around. Overheard: "Oh baby let my people go Pharaoh pharaoh ohh baby yeah yeah yeah"; then some christian rap; "no it was when Spongebob ripped his pants..."
Daniel is holding a garden hose tube, cleaning the big mixing bowl. "Dude you's got ho's!" someone shouts. "No just one!" Everyone laughs. Someone else leans over and says, "And that's exactly why they have the chants: to go over us." Another guy looks at the hose seriously and says, "I remember one time I left it in and flooded the room." Daniel mimics a heavy Egyptian accent and pretends to act like Uncle when people are being bad and he is angry: "Get out! Get out!" Uncle probably has missed the meaning of the last few comments and just smiles. When Uncle's not looking, little balls of dough get tossed into each others mouths. Eventually, the bread is all shaped and the next step, the baking, requires waiting for it to rise. Only two helpers need to stay for that portion. Everyone gathers in the hall and drinks orange crush and plays monopoly cards before heading out for the night. Daniel and his friend use the break to run over to a late night Chinese place and Daniel brings back some food for Uncle Atef, who keeps trying to pay him back the $7 for the chicken. Daniel refuses. "You've given me such a blessing Uncle." Beneath a mosaic of Christ feeding the 5000, they eat their Chinese food from Styrofoam boxes. Soon they will have to finish the baking, and get home around 4 am. Article 22: What Happened to the Toronto Reference Library's Fabric "Jungle"? When you entered the doors of the library you immediately saw an indoor fountain and pond, and above it, an insane mass of white fabric, both messy and elegant, rigorously ordered and overgrown. And you needed to walk beside the fountain and pond and beneath the folds of this fabric to get to the library proper, like passing through a jungle narrow to reach a lost temple of books. With this strange little space - lush, intimate, messy, soft, so different from the hardness and professional order of the city - and then the sudden vast open space of the library's wondrous 10-story atrium, the Reference Library was the most romantic and perfect of places in the entire city. So I was very sad to grow up and become a frequent visitor of the library but find the "jungle" gone. The pond was still there, but no sign of the fabric forest existed. Over the years I asked a number of people working at the circulation desks about it and they didn't know what I was talking about. Eventually someone suggested that I check out a certain binder that the library keeps amid the stacks on the top floor, a binder filled with newspaper clippings and documents about the library itself. There was the answer to what the jungle had been. It was "Lyra", a sculpture that the library had commissioned specially for that location by the entrance, created by artist Aiko Suzuki, a Japanese Canadian like the building's architect, Raymond Moriyama. A photograph of Lyra’s unveiling in 1981 shows dancers surrounded by the aerial sculptures: members of Toronto Dance Theatre performed in the library lobby’s emptied fountain pool at Suzuki’s request. According to a Toronto Star article by Lotta Dempsey July 26, 1980 Suzuki " sees the strands of white and earth tone fibre moving delicately with air currents - "breathing" - and catching light as its visual harp like music.... "I am not a weaver, or a craftsman" she says firmly "I am an artist." Lyra was made of 1 million feet of white nylon fiber and was the largest fiber sculpture ever commissioned in Canada, suspended from 146 points in the ceiling. It took Suzuki eight months to complete her 45 by 23 foot sculpture. So what had happened to Lyra? I was passed along your inquiry about Lyra. Although I’m relatively new to Toronto Reference Library, I was able to discover the following information. If you’d like to know more, please let me know and I’ll see what I can dig up. Lyra, a textile sculpture by Aiko Suzuki, hung at the entrance to the Toronto Reference Library from 1981 to 2003, at which time it was taken down at the request of the artist due to its deteriorated condition. The sculpture’s location near the main entrance, suspension over water and requirement to have fire retardant coating all contributed to physical deterioration of the textile over time. The Library then proceeded to secure an assessment to determine if the sculpture could be cleaned and restored to an acceptable level and what the feasibility of achieving that would be. Test results from the Canadian Conservation Institute concluded that the significant risk of the conservation treatment and the associated cost far outweigh the anticipated benefits of this work. Unfortunately, the artist’s original intent would not be able to be satisfactorily recaptured. Following the artist’s passing and with the test results available, library staff had a number of meetings and discussions with Ms. Suzuki’s daughter, we reached a mutual decision to decommission Lyra. There was the answer, with new and more melancholy questions. I sent Ms Byrne a number of these follow-ups and never received a response. But what answers would satisfy me. Something beautiful was gone. The Sierra Gorda Queretana is the land where this tale takes place. It was the last part of a trip I took to see the whole Sierra Gorda mountain range. A sprinter van drove a group of us to the highest part of the mountain that it could reach, and left us there. We could see most of the mountain, but some was hidden, and we needed to find a way to the the top where the “Mirador Cuatro Palos” stood. Before starting our way up, we saw these little dogs that looked like they were waiting for us. They were really friendly, they didn´t bark or move, and it looked as if they were smiling at us. They let us pet them. There was a particular one that caught our attention, it was a little black dog with little white paws. He just had one eye, a cute brown eye that will shine and make you fall in love with him. He was probably the most adorable dog l’ve ever seen. His none little eye cave looked kind of sad but with his one eye he looked out with so much joy, we were all happy to have met him. And when we started to go up the path, this dog and the others went before us as if to show us where to go. For each group of people, whether it was 2 people or 3 or 4 people, a single dog would walk in front of that particular group. A cute dog that looked like a fox started to walk in front me and my friend. All the dogs would stop every time a group wanted to take pictures, as if they were each friendly and patient guides, waiting until we were ready to continue. They took us forward in this marvelous silence, where words are not needed, and we followed them deeper and deeper into the mountain. When we got to the top, a fantastic view was waiting for us and all the dogs gathered together. Some went to sleep and others stood looking at their chosen people. After enjoying the view some of us started to walk back and the dogs were alert even if they had been taking a nap, and one by one, they started to go down with the people they had guided to the top. So did our little fox-like friend, who waited for us even though we were the last ones to leave the mirador (lookout). It was just nice to be with them, and for a moment to feel a part of them, a member of a pack of mountain dogs. Raphael is eating egg tarts in a Portuguese bakery on Dundas Street with Claire, a young woman from Corsica. Claire is visiting Toronto for a few days and Raphael is showing her some of the city. Raphael's family and Claire's family first met three generations ago amid the Corsican independence conflict. Claire’s family is Coriscan; Raphael’s family is French. While Corsica is a part of France, the island has a distinct culture and has a vigorous and sometimes violent independence movement. "When I was 9 years old I remember waking up at night to an explosion, because a neighbor's house had been bombed," says Claire. Raphael’s grandfather should have been bombed too: he had been sent to the island to be the military head of northern Corsica. His predecessor had his office bombed by Corsican nationalists. And the man who took the post after him got his office bombed too. But Raphael’s grandfather was never targeted, and the reason why is due in part to the event that drew the two families together. It began with a tragedy: Claire's grandma's husband was the first Corsican to die fighting with French forces in the Lebanese War. To honor the sacrifice of her husband, Raphael's grandfather wanted to be the person to officially bring her the tragic news. But she lived in a remote village in the mountains where most French officials feared to travel. He went anyway. As Raphael tells it, "Despite the danger of being shot, my grandfather went up there in the uniform of a French colonel, and gave her the news. A bunch of the men in the room with her just went insane and tried to kill my grandpa and she stopped them from doing that. Because she was extremely grateful for him. And ultimately they all respected it. It meant a lot to her that he did that. And it's one reason why our family began to get the respect of so many people on the island, and why my grandpa didn’t get his office bombed. And now, 40 years later, I'm showing her granddaughter some of Toronto." Raphael and Claire eat the rest of their Portuguese egg tarts. She and Raphael say something in French and then go out to see more of the city. Their grandparents would be proud.